Available for sale are issue #1 – #4 of Deadpool: The Circle Chase graded by CGC. This key mini-series marks the first time our favorite Merc with a Mouth appeared in his own solo comic book! Issues #1, #2 & #4 of this set are in CGC 9.6 NM+ condition and issue #3 is CGC 9.8 NM/M. With Deadpool 2 set to hit theaters on May 18, 2018 you can bet demand for key Deadpool comics like these will only go up. Grab this high grade set today while you can! This set recently sold via my eBay Store. Click here to find another set just like it! Available for sale is Deadpool The Circle Chase #1 in CGC 9.6 condition. This key comic marks the first time our favorite Merc with a Mouth appeared in his own solo series! With Deadpool 2 coming out this summer, you can bet demand (and thus the prices) for key Deadpool comics like this one are going to explode. Grab this issue today while you can, it won’t be here long! The comic listed here recently sold via my eBay Store for $82.00 with Free Shipping. Click here to find others just like it! Look what just came back from CGC graded in 9.8 NM/M condition! It’s the exclusive J. Scott Campbell “Cover A” edition of Domino #1! Only 2,800 total copies of this issue were printed and according to the CGC Census, just 35 have been graded so far as a 9.8 making this a hard to find item. Grab this amazing looking slab today while you can! Look what just came back from CGC graded in 9.8 NM/M condition! It’s the exclusive J. Scott Campbell “Cover B” edition of Domino #1! Only 2,300 total copies of this issue were printed and according to the CGC Census, just 25 have been graded so far as a 9.8 making this a hard to find item. Grab this amazing looking slab today while you can! Look what just came back from CGC graded in 9.8 NM/M condition! It’s the exclusive J. Scott Campbell “Cover C” edition of Domino #1 featuring a cover homage of the silver-age classic, Nick Fury Agent of Shield #4! Only 1,300 total copies of this issue were printed and according to the CGC Census, just 37 have been graded so far as a 9.8 making this a hard to find item. Grab this amazing looking slab today while you can! 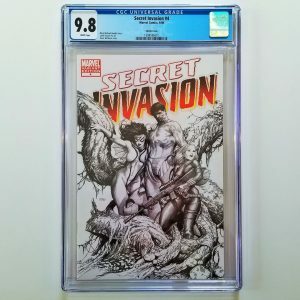 Look what just came back from CGC graded in 9.8 NM/M condition! It’s the exclusive J. Scott Campbell “Cover D” edition of Domino #1! 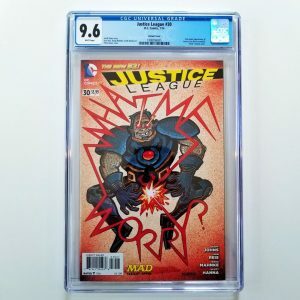 Only 1,300 total copies of this issue were printed and according to the CGC Census, just 41 have been graded so far as a 9.8 making this a hard to find item. Grab this amazing looking slab today while you can! The comic listed here recently sold via my eBay Store. Click here to find others like it! Available for sale is the first printing of Guardians of the Galaxy #1 graded by CGC in 9.8 NM/M condition. This new Guardians lineup first published in 2008 was the basis for the immensely popular Guardians of the Galaxy movie franchise set in the Marvel Cinematic Universe. According to the CGC Census, only 153 copies of this issue have been graded in 9.8 condition making it fairly uncommon. Don’t miss your chance to add this awesome slab to your collection today! This slab recently sold via my eBay Store. Click here to find others like it! Available for sale is Hero For Hire #1 graded in 6.5 FN+ condition by CGC. This is a key bronze age issue featuring the first appearance of Luke Cage. With the popularity of Netflix’s Luke Cage and Defenders series, demand for this comic has gone up substantially. With Season 2 of Luke Cage scheduled to drop in 2018, you can expect prices for this book to go up accordingly. Grab this one today while you still can! The graded comic listed here recently sold via my eBay Store for $245 with Free Shipping. Click here to find others just like it! Available for sale is Hulk #1 (2017) Hall of Comics / CBCS Edition B featuring an Incredible Hulk #181 Cover Swipe with art by EdMcGuinness graded in CGC 9.6 NM+ condition. 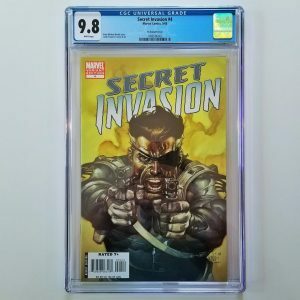 Don’t miss out on your chance to add this HOT graded comic to your collection today! Available for sale Incredible Hulk #340 featuring an iconic Todd McFarlane cover graded by CGC in 9.4 NM condition. Add this highly sought after modern key issue to your collection today! Available for sale is the Marco Checchetto 1:25 Variant of Incredible Hulk #711 that just came back from CGC graded in 9.8 NM/M condition. With only 16 copies of this book graded by CGC in 9.8 condition, now is your chance to own one today while you can. Available for sale is the Rick Leonardi “Venomized” Variant of Invincible Iron Man #5 graded by CGC in 9.8 NM/M condition. According to the CGC Census, only 30 copies of this variant have been graded in 9.8 condition, making it relatively difficult to come by. Grab this hot slab today while you can. Available for sale is this eBay Exclusive Variant of Marvel Legacy #1 in CGC 9.8 condition. 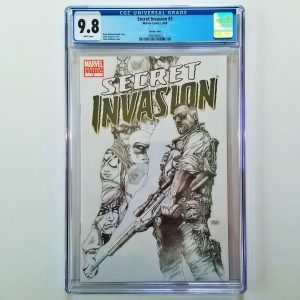 There were only 5,000 issues of this limited edition printed and according to the CGC Census this very slab is the only non-signature series CGC graded issue available today! The graded comic listed here recently sold on eBay for $83.00 with Free USPS Priority Mail Shipping. Find one like it here! Available for sale is Marvel-Team Up #141 graded by CGC in 8.0 VF condition featuring the first published appearance (tied with ASM #252) of Spider-Man’s black symbiote costume. As the story of the black suit has become more iconic over the years, eventually becoming Venom, the first appearances of Spider-Man wearing the black costume have become highly collectible. Grab this key issue today while you can! Available for sale is Moon Girl and Devil Dinosaur #1 graded by CGC in 9.2 NM- condition featuring the first appearance of Lunella Lafayette, aka Moon Girl. 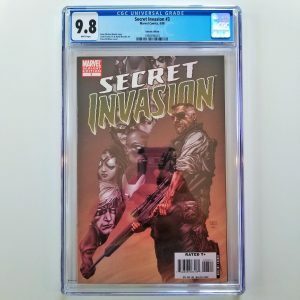 Add this key modern age slab to your graded comic collection today! Available for sale is Moon Girl and Devil Dinosaur #32 graded by CGC in 9.8 NM/M Condition featuring the first appearance of Princess Fisk. Grab this collectible modern age comic today!